Perk’s is owned and managed by Mary Lou Ramirez and Jesus Omar Gallegos. 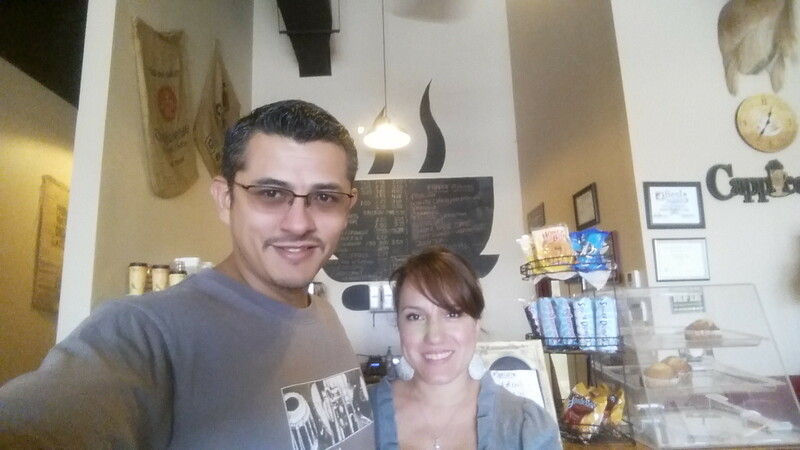 The couple bought Perk’s Coffee Cafe from Grant and Debbie on January 1st 2016. The coffee shop was situated across the street from Marshall High School. It was originally built by Stacey and Brian in 2012 to serve community and students of Marshall. After one year of operating the business, Mary and Omar decided to not renew the lease but keep operating the business. As of November of 2017, Perk’s Coffee Cafe became SA Perks LLC. Perks has been delivering Cold Press Coffee, Detox Waters and Juices, as well as healthy food to homes and places of work. They’ve adopted mason jars for their products and have customer recycling incentives for returned jars. They also sell their products at three locations, The Lions Den (Wurzbach and Vance Jackson), Simply Raw Nutrition (Helotes), and Blowout Bar (Southtown). Our mission is to make the world healthier with our products and recycle for sustainability. Some people in San Antonio are looking for a way to detox after holiday indulgence. A busy mom who loves experimenting with natural ingredients to boost her health is sharing some tricks she found to get back on track. SAN ANTONIO – Comfort foods and sweet treats over the holidays were delicious. Turkey gravy and pumpkin pie, while tasty, were not always on the mark with our health goals. Some people in San Antonio are looking for a way to detox after the indulgence. A busy mom who loves experimenting with natural ingredients to boost her health is sharing some tricks she found to get back on track. Mary Ramirez is San Antonio’s “detox lady.” What started as a Facebook post nine months ago, has grown into a business. SA Perks receives hundreds of orders a day for detox style waters and juices. With the holidays behind us and health goals before us, it is time to increase the vitamins and hydrate. Ramirez says fresh ingredients go a long way in boosting her energy. Grapefruit, cayenne, and honey are a few flavors in one of her most recent concoctions. One of the key ingredients in many of her beverages is apple cider vinegar. “[It is] a very powerful ingredient as well as the ginger and everything I put in the waters,” said Ramirez. She makes it clear that she is not a doctor. Ramirez encourages her customers to speak with their medical provider about implementing her detox waters and juices into their diet. She says at the very least the drinks are a great way to sneak variety into your meals. “A lot of people are like, ‘I hate vegetables, I can’t stand them,’ but they actually, with these juices, they’re able to intake all their fruits and veggies,” said Ramirez. SA Perks delivers the drinks to you. They even offer a recycling incentive for their mason jars.